In this section is described how to implement a new RESTUploadPathMapper sub-class. A RESTUploadPathMapper object is used for mapping the path of the uploaded files following new remapping policy. An example could be a Regular Expression remapping based on the input file name. * a mosaic. The implementor is free to alter the item path. Developers can choose both the relative path of the file (if it is inside a zip directory structure) and the filename itself. File remapping cannot return directories. If additional parameters are required, they can be stored inside the Metadata Map of the Global, WorkSpace or Store settings. 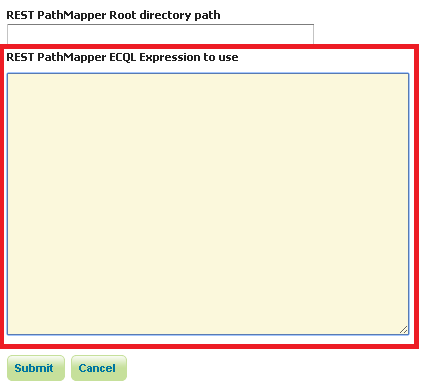 Extend the base implementation RESTUploadPathMapperImpl and create the desired PathMapper. If any optional parameter requires to be configured, then a GUI panel must be created using Wicket. The panel will be added to the Global and WorkSpace Settings configuration page. Creation of a new extension of the SettingsPluginPanel class. Note that this panel must extract the parameters from the Metadata Map of the settings object.